It's an Excellent Rock Live Concert . It's Saturday morning and I opened the day with a limited ed. CD of Arena "Pepper's Ghost" (third spin) at my CD player, turned my power amps with loud volume. Uugh . what an excellent album! I listened it in its entirety. (At the same time I received a short message on my mobile phone from my prog mate, Imam, telling me that he was rocking with Rush in Rio DVD). I then drove my 7th grade daughter, Dian, to school while playing Uriah Heep's "Sea of Light" - for a change as I have been listening too much "prog" so I need something like a hard driving music to elevate my spirit. Btw, she's got used to with her dad's rocking style - so don't worry she is okey with Uriah Heep. I'm fired up man. Right after I dropped her at school, "It's another time to rock man .! Yeah .." And I don't know why I changed the CD at my car's magazine with SAGA "In Transit" and I turned the volume completely LOUD because I was the only one in my car (freedooooom..!!!) and the street that I was driving was not congested with traffic. Yeah man . SAGA makes my day! 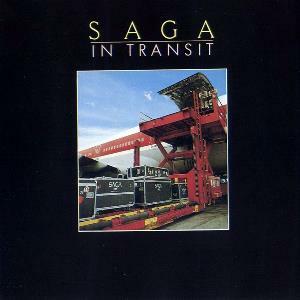 Well, I knew SAGA for the first time through this album and it BLEW me away .. I love live records and this record is so excellent, energetic and delivered excellently by the band. I think this album is one of the best rock live records I have ever known so far. By the time I knew this album, I never listened to the band's studio album. [My dear readers, big apology for a very long background I keyed in the beginning. I'm just trying to project the nuance where I spin this CD as music has always colored my day-to-day life. No music no life.]. Let's talk about the album in great details . This live record starts off with MC's short rocking speech "Ladies and gentlemen would you welcome ..SAGA .!!!" followed with noisy hand clapping from the crowd (I like it man!). It continues with single layer keyboard punch followed with solo and louder hand clapping and shouting from the crowd and drum set's high-hat work followed with drumming and bass. It remarks the performance of first track Careful Where You Step wonderfully. What a lively rock concert nuance I can sense right here from the CD! I can not imagine if I was there in the concert, I would sing a long with the band man . The lead singer enters the music with a powerful and energetic vocal. This song is packed with great keyboard, sometimes in staccato styles and stunning guitar. The music passage that starts from minute [2:10] until end is so powerful for my personal taste as it has so many catchy segments as results of intertwining sounds of keyboard, guitar and drum. It kills my heart (not joking) really. So melodic and powerful, performed in progressive style at its best! The second track Don't Be Late flows seamlessly from the opening track. At the opening part it consists of voice line accompanied with inventive keyboard sound and high-hat sounds from drum set. Unlike the first track, this one is performed in slow-moderate tempo style with great keyboard work at background and its dynamic play during transition pieces. Guitar solo takes its part nicely in the middle of the track. An excellent track. Humble Stance is truly a KILLER! Yeah man . this is my best favorite SAGA songs I have ever known so far! "And the next tune ..is from album number one. It's called Humble Stance" - followed with heavy clapping / shouting from the crowd and a catchy keyboard intro. Oh man .. I love this sound! The clapping getting louder and the drum sound enters the music wonderfully followed with a combination of guitar and keyboard. Lead singer enters the music in his energetic singing style with very strong accentuation at the end part of lyrical phrases. Again, this track is packed with catchy melodies with excellent combination of keyboard and guitar for both roles: as rhythm section or as solo. Melodic but energetic style of composition. Wind Him Up starts with an uplifting mood with more upbeat tempo. It contains wonderful keyboard and guitar works with a sort of electric drum sound. The music flow in relatively straight forward structure. It features some catchy melody and nice solos. The guitar rhythm sounds like a soft riffs especially in transitions. The guitar solo in the middle of the track augmented with keyboard is stunning. Drums also demonstrate its dynamic play. The next song How Long kicks off with unique keyboard sound accompanied by drumming. The vocal enters the music with solid accentuation singing style. The interlude contains harmonious sounds of guitar and keyboard. It continues with a mellow track exploring keyboard / effects and vocals under No Regrets. The show continues with the band's communication with the crowd "Are You Ready?" continued with amazing drum solo under A Brief Case. Excellent solo rich with variations. It continues with soft guitar riffs that remark the start of You're Not Alone, performed in medium-fast tempo with multi vocals. The show concludes with On The Loose. Recommended. This live album is I think accessible to wider rock music buffs - be it progger or non-progger - as it's so lively and so attractive. Uhm .. I wrote this view with deep emotional involvement as I feel like I'm part of the crowd who watch the band plays live. Keep on proggin' .!! !